The East Alligator Region is 46klms from Jabiru, you will find the turnoff on the Arnhem Highway approx. 5klms before you reach Jabiru. It is the Oenpelli, Ubirr turnoff. The road to the East Alligator Region is sealed and fine for 2wd in the dry season. In the wet season the Magela Creek can be up so you will need to check this beforehand with Bowali Visitor Centre located 5klms from Jabiru on the Kakadu Highway. 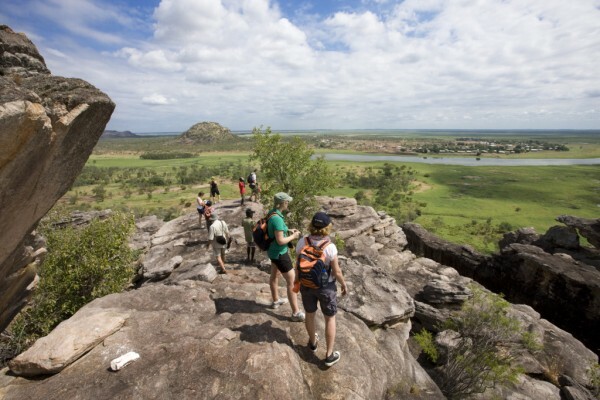 Ubirr is open 8am til sunset in the dryer months and 2pm til sunset over the wet season. It can be inaccessible during the wet sometimes due to the Magela Creek flooding. This walk is 2.5klms and winds through woodlands and wetlands alongside the East Alligator River. The walk leads you through the rainforest to an viewing platform overlooking the East Alligator River. The walks range from 600metres to 1.5 kilometres and the longest walk will take you about 1 hour. you can choose to do the walk on your own or join the guided walk that departs the information shelter at the boat ramp on the East Alligator River. Tip: If you want to do Ubirr for sunset and the Guluyambi Cruise, it is a good idea to do the 3pm Cruise and then drive the short distance to Ubirr for sunset. You will be advised the times you are able to cross due to tides. The Border Store operates in the peak season and is a great place to stop for a cold drink, some lunch or and icecream. This managed campground has flushing toilets and hot and cold shower facilities. Generators are not allowed at this campground. Drinking water is available at this site. Tip: Obviously when bush camping you are going to have mosquito’s, so take plenty of repellent.